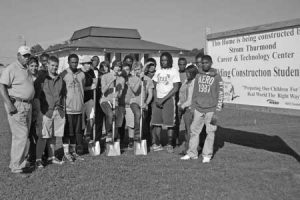 The Building Construction students at Strom Thurmond Career and Technology Center (STCTC) are building a home in front of the school. “I’ve wanted to build a house with my students for years because they will learn so much” said Lewis Burt, Building Construction teacher. Log Creek Timber Company is the project sponsor. “We now how important education is for our community’s future and we are excited about supporting this project” explained Reg Williams, with Log Creek Timber. The students are building a home designed to be moved and is approximately 1500 square feet. Edgefield County Building and Planning Department will inspect the construction process through each stage of construction. “This is a great experience for students. There are so many career opportunities for young people in the construction field” stated Wayne Collins with Edgefield County Building and Planning. Seventeen students will work on the building project this year. Five of the students are Building Construction II students and the other twelve are first year students. About 10% of the Building Construction programs in the state provide the opportunity for their students to construct a home. Fab Burt, Lewis Burt’s brother is the subcontractor for the plumbing and electrical for the home. “My brother will let my students learn those parts of the process while he is working. That is just another great experience for the students” explained Burt. “STCTC is doing everything it can to make sure our students are prepared for the world of work” said Arthur Northrop, STCTC Director. Each student involved in the process is completing a portfolio. The portfolios have photographs and explanations of each stage of the home construction process. Each student will have complete documentation of each stage of the process when they are done. The students will present the portfolio to potential employers to document their skills and their knowledge. “The portfolios are so important. It’s one thing to say you know how to do something; it’s another to show proof that you have done it” said Northrop.